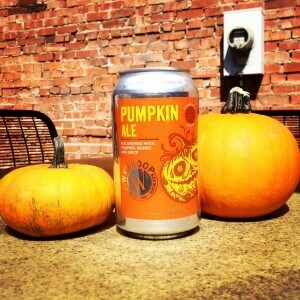 Wynkoop Brewing Company will release its highly acclaimed Pumpkin Ale on October 1st, 2014 in a hand-designed can. The Pumpkin Ale is a lightly spiced English-Style Brown Ale with three preparations of pumpkin added to the mash. The Pumpkin Ale, part of Wynkoop’s seasonal Even Smaller Batch series, features a smooth malt backbone with additions of CaraMalt, Crystal and roasty Brown malts. These malts are complemented with light additions of a secret spice blend to add a warming drinkability to the beer. The pumpkins are added to the mash in three ways- dried, pureed and fresh-roasted. The three preparations of pumpkin bring out the best flavor characteristics of the glorious gourd. These delicately brewed ingredients come together to create an ale that celebrates the harvest spirit enjoyed by all at the Wynkoop. The new can features art hand-drawn by Studio Pattern and is in keeping with the new Even Smaller Batch series design theme introduced by Patty’s Chile Beer earlier this year. The labels for the Even Smaller Batch series are caringly applied by hand in the packaging workshop of the brewery, located in the building’s basement. Wynkoop’s Pumpkin Ale has been a perennial fall favorite around the brewpub for years. This will be its second release in cans and will be distributed in liquor stores around the Front Range. To find Wynkoop’s Pumpkin Ale, use the Wynkoop Beerfinder located at bit.ly/wynbf. To get Wynkoop’s Pumpkin Ale Press Release delivered to your inbox, please reach out to our Marketing Team at the attached address. Cheers!